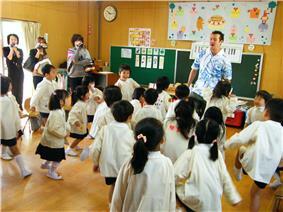 A kindergarten in Japan on Japanese Parents' Day, October 2009. First day of Iranian new education year, for kindergarten students and elementary school newcomers, in Nishapur. A kindergarten (German, German pronunciation: ), literally children's garden (from Kinder, plural form of Kind, "child", and Garten, "garden") is a preschool educational approach traditionally based on playing, singing, practical activities such as drawing, and social interaction as part of the transition from home to school. The first such institutions were created in the late eighteenth century in Bavaria and Strasbourg to serve children both of whose parents worked out of the home. The term Kindergarten was coined by Friedrich Fröbel, whose approach greatly influenced early-years education around the world. The term is used in many countries to describe a variety of educational institutions for children ranging from two to seven years of age, based on a variety of teaching methods. In 1779, Johann Friedrich Oberlin and Louise Scheppler founded in Strasbourg an early establishment for caring for and educating pre-school children whose parents were absent during the day. At about the same time, in 1780, similar infant establishments were established in Bavaria. In 1802, Pauline zur Lippe established a preschool center in Detmold, the capital of the contemporary German Principality of Lippe (nowadays part of the State of North Rhine-Westfalia). Samuel Wilderspin opened his first infant school in London in 1819, and went on to establish hundreds more. He published many works on the subject, and his work became the model for infant schools throughout England and further afield. Play was an important part of Wilderspin's system of education. He is credited with inventing the playground. In 1823, Wilderspin published On the Importance of Educating the Infant Poor, based on the school. He began working for the Infant School Society the next year, informing others about his views. He also wrote "The Infant System, for developing the physical, intellectual, and moral powers of all children from 1 to seven years of age". 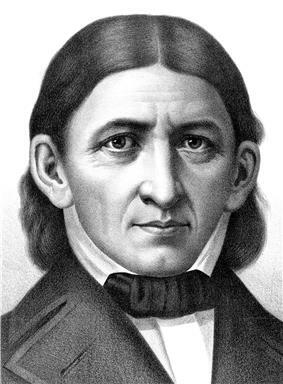 Friedrich Fröbel created the name Kindergarten in Germany in 1840. Countess Theresa Brunszvik (1775–1861), who had known and been influenced by Johann Heinrich Pestalozzi, was influenced by this example to open an Angyalkert ("angel garden" in Hungarian) on May 27, 1828 in her residence in Buda, the first of eleven care centers that she founded for young children. In 1836 she established an institute for the foundation of preschool centers. The idea became popular among the nobility and the middle class and was copied throughout the Hungarian kingdom. Friedrich Fröbel (1782–1852) opened a Play and Activity institute in 1837 in the village of Bad Blankenburg in the principality of Schwarzburg-Rudolstadt, Thuringia, as an experimental social experience for children entering school. He renamed his institute Kindergarten on June 28, 1840, reflecting his belief that children should be nurtured and nourished "like plants in a garden". 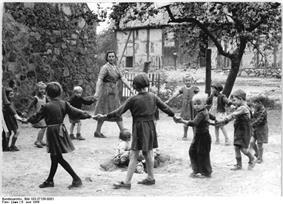 Women trained by Fröbel opened kindergartens throughout Europe and around the World. The first kindergarten in the United States was founded in Watertown, Wisconsin in 1856 and was conducted in German. Elizabeth Peabody founded America's first English-language kindergarten in 1860. The first free kindergarten in America was founded in 1870 by Conrad Poppenhusen, a German industrialist and philanthropist, who also established the Poppenhusen Institute. The first publicly financed kindergarten in the United States was established in St. Louis in 1873 by Susan Blow. Canada's first private kindergarten was opened by the Wesleyan Methodist Church in Charlottetown, Prince Edward Island in 1870 and by the end of the decade, they were common in large Canadian towns and cities. The country's first public-school kindergartens were established in Berlin, Ontario in 1882 T Central School). 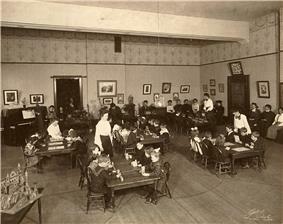 In 1885, the Toronto Normal School (teacher training) opened a department for kindergarten teaching. Describing the use of the term around the world. In Afghanistan, children between the age of 3 and 6 attend kindergartens (Dari: کودکستان‎; Pashto: وړکتون‎), which though not part of the school system are often run by the government. ECD programs were first introduced during the Soviet occupation with the establishment in 1980 of 27 urban preschools, or kodakistan. The number of preschools grew steadily during the 1980s, reaching a high of more than 270 by 1990, with 2,300 teachers caring for more than 21,000 children. These facilities were an urban phenomenon, mostly in Kabul, and were attached to schools, government offices, or factories. Based on the Soviet model, they provided nursery care, preschool, and kindergarten for children from 3 months to 6 years of age under the direction of the Department of Labor and Social Welfare. The vast majority of Afghan families were never exposed to this system, and many of these families are in opposition of the program due to the belief that it diminishes the central role of the family and inculcates children with Soviet values. 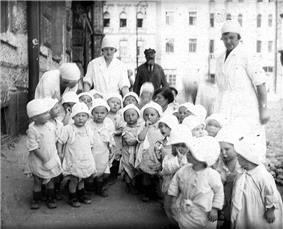 With the onset of civil war after the Soviet withdrawal, the number of kindergartens dropped rapidly. By 1995, only 88 functioning facilities serving 2,110 children survived, and the Taliban restrictions on female employment eliminated all of the remaining centers in areas under their control. In 2007, there were about 260 early years centers serving over 25000 children. Though every government center is required to have an early childhood center, at present, no governmental policies deal with early childhood and no institutions have either the responsibility or the capacity to provide such services. A kindergarten in Hanoi, Vietnam in 2011. In each state of Australia, kindergarten (frequently referred to as "kinder" or "kindy") means something slightly different. In Tasmania, New South Wales and the Australian Capital Territory, it is the first year of primary school. In Victoria, kindergarten is a form of preschool and may be referred to interchangeably as preschool or kindergarten. In Victoria and Tasmania the phrase for the first year of primary school is called Prep (short for "preparatory"), which is followed by grade 1. In Queensland, kindergarten is usually an institution for children around the age of 4 and thus it is the precursor to preschool and primary education. The year preceding the first year of primary school education in Western Australia, South Australia or the Northern Territory is referred to respectively as pre-primary, reception or transition. In New Zealand, kindergarten can refer to education in the 2 years preceding primary school, from age 3 to 4. Primary Education starts at age 5.The Auckland Kindergarten Association (AKA) provides a range of early childhood education services (ECE) across the greater Auckland region - with over 100 kindergartens, 4 KiNZ daycare centres and playgroups. In Bangladesh, the term "kindergarten", or "KG School" (Kindergarten School), is used to refer to the schooling children attend from 3 to 6 years of age. 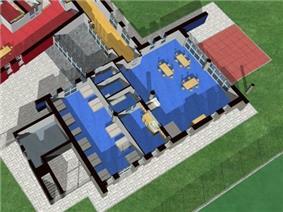 The names of the levels are nursery, shishu (children), etc. But the view of kindergarten education has changed much from previous years. Almost every rural area now has at least one Kindergarten School, with most being run in the Bengali language. They also follow the text books published by the National Curriculum and Textbook Board (NCTB) with a light modification, adding some extra books in syllabus. The grades generally start from Nursery (sometimes "Play"), "KG" afterwards, and ends with the 5th grade. Separate from the National Education System, kindergarten is contributing greatly toward achieving the Millennium Development Goal of universal primary education in Bangladesh. In Bulgaria, the term detska gradina (деτска градина) refers to the schooling children attend from 3 to 7 (in some cases 6) years of age. The last year of kindergarten is also referred to as preschool. It is elective. The actual school starts as grade 1. Student teachers training in a kindergarten class in 1898 in Toronto, Canada. Schools outside of Quebec and Ontario generally provide one year of kindergarten, except some private schools offer junior kindergarten for 4-year-olds (school before kindergarten is most commonly referred to as pre-school). After kindergarten, the child begins grade one. The province of Nova Scotia refers to Kindergarten as Grade Primary. Within the province of Quebec, junior kindergarten is called prématernelle (which is not mandatory), is attended by 4-year-olds, and senior kindergarten is called maternelle, which is also not mandatory by the age of 5, this class is integrated into primary schools. Within the French school system in the province of Ontario, junior kindergarten and senior kindergarten are called maternelle and senior kindergarten is sometimes called jardin d'enfants, which is a calque of the German word Kindergarten. Preschool (学前班/xué qián bān): 5- to 6-year-old children Some kindergartens may not have preschool (学前班/xué qián bān). The public kindergartens only accept children older than 3 years, while private ones do not have such limitations. 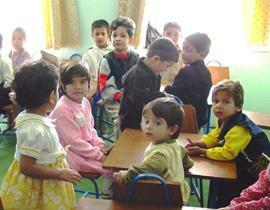 In Egypt, children may go to kindergartens for two years (KG1 and KG2) between the ages of four and six. its true. In France, pre-school is known as école maternelle (French for "nursery school", literally "maternal school"). Free maternelle schools are available throughout the country, welcoming children aged from 2 to 6 (although in many places, children under three may not be granted a place). The ages are divided into grande section (GS: 5-year-olds), moyenne section (MS: 4-year-olds), petite section (PS: 3-year-olds) and toute petite section (TPS: 2-year-olds). It is not compulsory, yet almost all children aged 3 to 5 attend. It is regulated by the Ministry of National Education. In Germany, Kindergarten (masculine: der Kindergarten, plural Kindergärten) refers to a facility for the care of pre-school children which are typically at least three years old. By contrast, Kinderkrippe or Krippe refers to a facility for the care of children before they enter Kindergarten (9 weeks to ca. three years), Kindertagesstätte—literally "children's day site", usually shortened to Kita—is an umbrella term for any day care facility for pre-schoolers. Attendance is voluntary, but usually not free of charge; however, pre-school children over the age of one are entitled to receive local and affordable day care. Within the federal system, Kindergärten fall under the responsibility of the states, which usually delegate a large share of the responsibility to the municipalities. Due to the subsidiarity principle stipulated by §4 SGB VIII, there is a multitude of operators, from municipalities, churches and welfare societies to parents' initiatives and profit-based corporations. Many Kindergärten follow a certain educational approach, such as Montessori, Reggio Emilia, "Berliner Bildungsprogramm" or Waldorf; forest kindergartens are well established. Most Kindergärten are subsidised by the community councils with the fees depending on the income of the parents. Due to the prevalent religions present in Germany, Roman Catholic and Lutheran, even in smaller townships there are often both Catholic and Protestant kindergartens available. Kindergärten can be open from 7 a.m. to 5 p.m. or longer and may also house a crèche (Kinderkrippe) for children between the ages of eight weeks and three years, and possibly an afternoon Hort (often associated with a primary school) for school-age children aged 6 to 10 who spend the time after their lessons there. Alongside nurseries, there are day-care nurses (Tagesmütter or Tagespflegepersonen) working independently from any pre-school institution in individual homes and looking after only three to five children, typically up to the age of three. These nurses are supported and supervised by local authorities. In Hungary a kindergarten is called an óvoda ("place for caring"). Children attend kindergarten between ages 3–6/7 (they go to school in the year in which they have their 7th birthday). Attendance in kindergarten is compulsory from the age of 3 years, though exceptions are made for developmental reasons. Though kindergartens may include programs in subjects such as foreign languages and music, children spend most of their time playing. In their last year children begin to be prepared to attend elementary school. In India, there are only informal directives pertaining to pre-primary education, for which pre-primary schools and sections need no affiliation. Directives state that children who are three years old on 30 May in the given academic year are eligible to attend Nursery and Kindergarten classes. Typically, children spend 3 to 4 years of their time in pre-primary school after which they are eligible to attend 1st Standard in Primary School which falls under HRD ministry norms. Primary education in now compulsory in India, and accompanied with mid-day meals, in most parts of the country run by the government. Pre-primary is not mandatory, however preferred. All government schools and affiliated private schools allow children who are 5 years of age as of 30 May to enroll to standard 1 of a primary school. In Israel kids must attend kindergarten ("גן חובה"). Early childhood education begins at home, and there are numerous books and television shows aimed at helping mothers & fathers of preschool children to educate their children and to parent more effectively. Much of the home training is devoted to teaching manners, proper social behavior, and structured play, although verbal and number skills are also popular themes. Parents are strongly committed to early education and frequently enroll their children in preschools. Kindergartens (幼稚園 yōchien), predominantly staffed by young female junior college graduates, are supervised by the Ministry of Education, but are not part of the official education system. The 58 percent of kindergartens that are private accounted for 77 percent of all children enrolled. In addition to kindergartens there exists a well-developed system of government-supervised day-care centers (保育園 hoikuen), supervised by the Ministry of Labor. Whereas kindergartens follow educational aims, preschools are predominately concerned with providing care for infants and toddlers. Just as there are public and private kindergartens, there are both public and privately run preschools. Together, these two kinds of institutions enroll well over 90 percent of all preschool-age children prior to their entrance into the formal system at first grade. The Ministry of Education's 1990 Course of Study for Preschools, which applies to both kinds of institutions, covers such areas as human relationships, health, environment, language, and expression. Starting from March 2008 the new revision of curriculum guidelines for kindergartens as well as for preschools came into effect. In South Korea, children normally attend kindergarten (Korean: 유치원 yuchi won) between the ages of three or four and six or seven in the Western age system. (Korean ages are calculated differently from Western ages: when they are born they are considered one-year-olds, rather than one day old. Additionally, every January 1, everyone's age increases by one year regardless of when their birthday is. Hence in Korea, kindergarten children are called five-, six- and seven-year-olds.) The school year begins in March. It is followed by primary school. Normally the kindergartens are graded on a three-tier basis. Korean kindergartens are private schools. Costs per month vary. Korean parents often send their children to English kindergartens to give them a head start in English. Such specialized kindergartens can be mostly taught in Korean with some English lessons, mostly taught in English with some Korean lessons, or completely taught in English. Almost all middle-class parents send their children to kindergarten. In Kuwait, Kuwaiti children may go to free kindergartens for two years (KG1 and KG2) between the ages of four and six. In Malaysia, kindergarten is known as tadika. Most kindergartens are available to children of ages five and six (and some are available to children as young as four). For children up to the age of three (or four), there are pre-school playgroups. There are no fixed rules for when a child needs to go to a kindergarten, but the majority will when the child turns 5 years old. The child will usually attend kindergarten for 2 years, before proceeding to primary school at age 7. In Mexico, kindergarten is called kínder, with the last year sometimes referred to as preprimaria (primaria is the name given to grades 1 through 6, so the name literally means "prior to elementary school"). The kindergarten system in Mexico was developed by professor Rosaura Zapata, who received the country's highest honor for her contribution. It consists of three years of pre-school education, which are mandatory before elementary school. Previous nursery is optional, and may be offered in either private schools or public schools. In the Netherlands, the equivalent term to kindergarten was kleuterschool. From the mid-19th century to the mid-20th century the term Fröbelschool was also common, after Friedrich Fröbel. However this term gradually faded in use as the verb Fröbelen gained a slightly derogatory meaning in everyday language. Until 1985, it used to be a separate non-compulsory form of education (for children aged 4–6 years), after which children (aged 6–12 years) attended the primary school (lagere school). After 1985, both forms were integrated into one, called basisonderwijs (Dutch for primary education). For children under 4, the country offers private, subsidized daycares (kinderdagverblijf), which are non compulsory but nevertheless very popular. In Norway, barnehage (children's garden) is the term equivalent to kindergarten, used for children in the ages between 10 months and 6 years. The first barnehager were founded in Norway in the late 19th century. Even though they have existed for 120 years, they are not considered to be part of the education system. They are both publicly and privately owned and operated. The staff, at minimum the manager, should be educated as førskolelærer (pre-school teachers). The children spend most of the time outdoors. There is also an institution called barnepark (children's park), which does not have to certified staff. Although not required in some states, kindergarten is a vital part of a child's success in first grade. In most schools it is not a full day program and students complete 2 hours of language arts, and 1 and a half hours of math lessons daily. When students leave kindergarten, they are expected to know the names of all letters (upper and lowercase), letter sounds, how to blend and segment simple words, write sentences, identify and write numbers 1 through 20, count objects up to 20, and add and subtract numbers 1 through 10. In the Waldorf and Montessori schools, children may begin kindergarten as early as age 3 to 4 and stay for several years in a play- and activities-oriented program. In the United States, kindergarten is usually part of the K-12 educational system. While kindergarten was once viewed as a separate part of the elementary program, it is now generally considered the first year of formal education and fully integrated into the school system. In most state and private schools, children begin kindergarten at age 5 to 6 and attend for one year. Though in some states kindergarten is compulsory, as the age of required schooling begins at age 5, in others, compulsory education begins at age 6, 7, or (in two states) 8. Forty-three states require their school districts to offer a kindergarten year. Nursery forms part of the Foundation Stage of education. In the 1980s, England and Wales officially adopted the Northern Irish system whereby children start school either in the term or year in which they will become five depending on the policy of the local education authority. In Scotland, schooling becomes compulsory between the ages of 4½ and 5½ years, depending on their birthday (school starts in August for children who were 4 by the end of the preceding February). The first year of compulsory schooling is known as Reception in England, Dosbarth Derbyn in Welsh and Primary One in Scotland and Northern Ireland. Some nurseries are attached to state infant or primary schools, but many are provided by the private sector. The government provides funding so that all children from the age of three until they start compulsory school, can receive five sessions per week of two and a half hours each, either in state-run or private nurseries. Working parents can also spend £55 per week free of income taxes, which is typically enough to pay for one or two days per week. In the UK children have the option of attending nursery at the ages of three or four years, before compulsory education begins. Before that, less structured childcare is available privately. The details vary between England, Northern Ireland, Scotland and Wales. The term kindergarten is rarely used in Britain to describe modern pre-school education; pre-schools are usually known as nursery schools or forest kindergartens, and is sometimes used in the naming of private nurseries that provide full-day child care for working parents. Historically the word was used during the nineteenth century when activists like Adelaide Manning were introducing educators to the work of Friedrich Fröbel. In 2010, a total of 56% of children aged one to six years old had the opportunity to attend preschool education, the Education and Science Ministry of Ukraine reported in August 2010. Many preschools and kindergartens where closed previously in light of economic and demographic considerations. In Sweden, kindergarten activities were established in the 19th century, and have been widely expanded since the 1970s. In Spain, kindergarten is called infantil, ciclo infantil or guardería, and serves children from 3 to 6 years of age. It's commonly known by some people as parvulitos. Kindergartens in Singapore provide up to three years of preschool programs for children aged between three and six. The three-year program, known as nursery, kindergarten 1 (K1), and kindergarten 2 (K2), prepares children for their first year in primary school education. Some kindergartens further divide nursery into N1 and N2. In the Russian Federation, Детский сад (literal translation of "children's garden") is a preschool educational institution for children, usually 3 to 6 years of age. 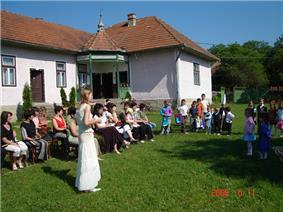 In Romania, grădiniţă, which means "little garden", is the favored form of education for preschool (under-6 or -7) children. The children are divided in "little group" (grupa mică, age 3–4), "medium group" (grupa mijlocie, age up to 5) and "big group" (grupa mare, up to 6 or 7). 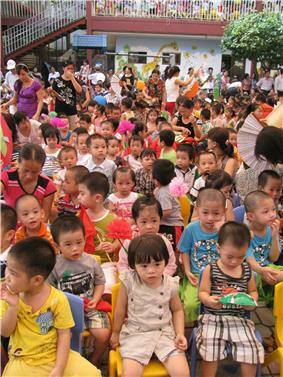 In the last few years, private kindergartens have become popular, supplementing the state preschool education system. ^ Achtes Buch Sozialgesetzbuch, §24; children under the age of one are entitled to day care if the caretaker is working, seeking work or attending school (section one); children from one to three years (section two) and from over three until they enter school (section three) are unconditionally entitled to receive day care.